From the Cumberland Gap to the Atlantic Ocean, this is Virginia Water Radio for the week of April 20, 2015. This week we join a springtime stream search for animals known for their shells, slow pace, and slimy trails. Have a listen for about 40 seconds and see if you can guess this group of animals, before the recording gives it away at the end. If you guessed snails, you’re right! 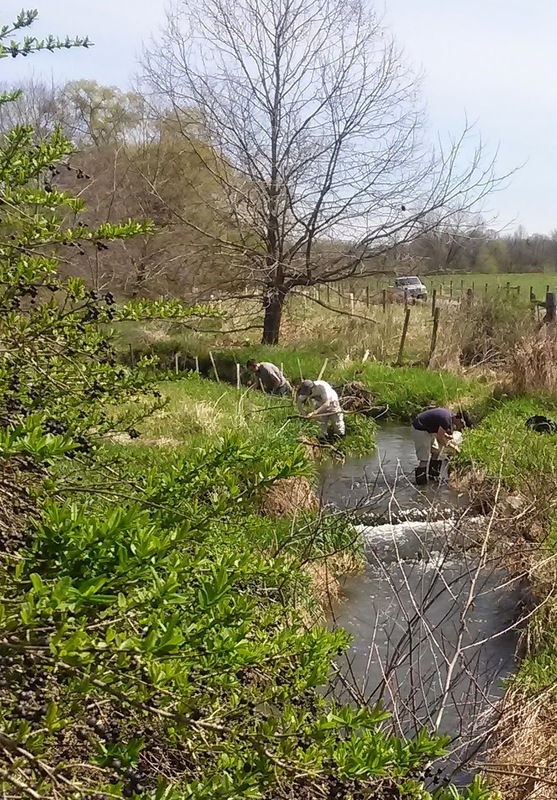 You heard three Virginia Tech students in April 2015 sampling a stream for freshwater snails. At least 70 species of snails live in Virginia’s streams, rivers, ponds, and other freshwater bodies, and Virginia’s streams in the Ohio River basin are part of one of North America’s most species-rich freshwater snail areas. Like land snails, freshwater snails have a single shell, which differs in shape and size among different snail families. Snails make up a large majority of the animals known as mollusks, which also includes bivalve, such as clams, with two shells; squids and octopuses, which have an internal shell; and several other groups. Aquatic snails use a fleshy foot to attach to rocks, plants, or other underwater surfaces and to secrete the slimy mucus that helps the foot move. Most freshwater snails feed by scraping algae from underwater surfaces, and this grazing benefits other aquatic organisms. Snails, in turn, are food for a large number of other animals, including certain fish, amphibians, waterfowl, and turtles. Virginia Tech students searching for freshwater snails in Stroubles Creek in Blacksburg, Va., April 12, 2015. Freshwater snails in the South Fork Roanoke River near Elliston, Va. (Montgomery County), July 13, 2014. The sounds in this episode were recorded on April 12, 2015, during a freshwater snail sampling session by three Virginia Tech students Daniel Doulong, David Shields, and Dyllan Taylor. The students were working in a section of Stroubles Creek (a New River tributary) in Blacksburg. The students were doing a research project on snail populations as a class project in the freshwater ecology course being taught in the spring 2015 semester by Dr. Fred Benfield of the Virginia Tech Department of Biological Sciences. Thanks to the students for permission to record their work and use their voices in this episode. Illinois Natural History Survey, “Mollusks,” online at http://wwx.inhs.illinois.edu/outreach/animals/mollusks/. Paul D. Johnson, Freshwater Snail Biodiversity and Conservation, Pub. No. 420-630, Virginia Cooperative Extension, Blacksburg, Va., 2009; available online at https://pubs.ext.vt.edu/420/420-530/420-530_pdf.pdf. New Hampshire Public Television’s Nature Works Web site, “Squid and Octopus,” online at http://www.nhptv.org/natureworks/nwep6f.htm. Virginia Department of Game and Inland Fisheries (VDGIF), “Fish and Wildlife Information Service,” online at http://vafwis.org/fwis/?Menu=Home.Species+Information. “Snails” search results on 4/15/15 at this link (234 species). One can search by common name or scientific name of species or groups. VDGIF, “List of Native and Naturalized Fauna of Virginia—March 2012,” available online at http://www.dgif.virginia.gov/wildlife/virginianativenaturalizedspecies.pdf (lists freshwater and [in part] terrestrial snails, but not marine species). J. Reese Voshell, Jr., A Guide to Common Freshwater Invertebrates of North America, McDonald & Woodward, Blacksburg, Va., 2002. R. T. Dillon, Jr., et al., “The Freshwater Gastropods of North America,” online at http://www.fwgna.org/. This is an effort to document the species in all 15 families of gastropods in North America north of Mexico. The Virginia section of the Web site is at http://www.fwgna.org/FWGVA/. ETI Bioinformatics/Key to Nature Series, online at http://www.keytonature.eu/wiki/ETI_BioInformatics. The “Marine Species Identification Portal/Molluscs” is available online at http://species-identification.org/index.php?groep=Molluscs&selectie=12&hoofdgroepen_pad=%2C1%2C12. The site identifies the many species of gastropods and other mollusks (also written “molluscs”) that inhabit marine waters worldwide. VDGIF, “Freshwater Mussels,” online at http://www.dgif.virginia.gov/wildlife/freshwater-mussels.asp; and “Freshwater Mussel Restoration,” http://www.dgif.virginia.gov/awcc/freshwater-mussel-restoration/.